With everyone talking about cloud storage, you would think it would be the end-all solution for many organizations wanting a better storage strategy for their infrastructure. However, is it a strategy you should be looking at? 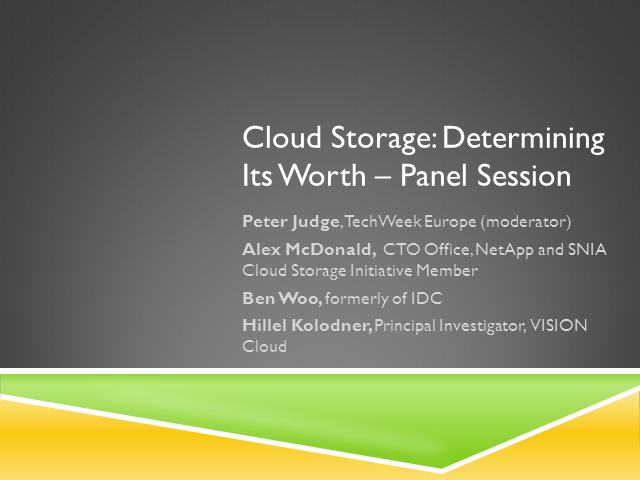 Join this panel of storage experts as they jump into the cloud to see when cloud storage is worth it and when it isn't. competitive landscape, many architectural decisions have become an exercise in avoiding error rather than exploring possibility. Whilst an acceptance of failure is becoming the norm in smaller development faced activities, architects must make big decisions that can affect the entire operation of an organisation. This webinar explores some ideas for architectural best practice and mechanisms for reducing risk whilst empowering architects to unleash some of the exciting new options available to them. sectors and also from breaking the standard rules within their own industry. - How do we look across industries and learn from success in others? - How do we escape from the ‘me too’ transformational activity and break away from trying to keep up and get in front? The majority of organisations today are running their IT estate across multiple platforms including private clouds, on-premise data centres, software as a service, and public clouds. Whilst this flexibility can drive significant business benefit, there are a number of key areas of operations and governance that require a different approach. Many organisations have suffered from cost management challenges despite the claims of many cloud providers that their platform will create savings and so we will examine options for effective cost management that actually work – and the pitfalls to avoid! Cloud itself has a well-established security pedigree but managing security and risk across multiple clouds adds a layer of complexity that can lead to issues and so we will explore some of the key risks in such an environment and suggest how these can also be mitigated. Effectively protecting critical data in the cloud is a key challenge for today's data-driven businesses. - Why and how today organisations are protecting data in the cloud. - What are the main risks inherent in the adoption of cloud services? - Where the key challenges are in protecting data in the Cloud? Kubernetes, microservices, AI and machine learning have forever changed the traditional enterprise tech stack. As DevOps practices become increasingly more adopted and widely used, automation is imperative for your tech teams and cloud infrastructure to remain scalable and turnkey. Join this live panel discussion with experts in the Cloud, IT Infrastructure and DevOps communities as they discuss these and other major trends, and what to look out for in the coming years. We’re all accustomed to transferring money from one bank account to another; a credit to the payer becomes a debit to the payee. But that model uses a specific set of sophisticated techniques to accomplish what appears to be a simple transaction. We’re also aware of how today we can order goods online, or reserve an airline seat over the Internet. Or even simpler, we can update a photograph on Facebook. Can these applications use the same models, or are new techniques required? One of the more important concepts in storage is the notion of transactions, which are used in databases, financials, and other mission critical workloads. However, in the age of cloud and distributed systems, we need to update our thinking about what constitutes a transaction. We need to understand how new theories and techniques allow us to undertake transactional work in the face of unreliable and physically dispersed systems. It’s a topic full of interesting concepts (and lots of acronyms!). In this webcast, we’ll provide a brief tour of traditional transactional systems and their use of storage, we’ll explain new application techniques and transaction models, and we’ll discuss what storage systems need to look like to support these new advances. And yes, we’ll explain all the acronyms and nomenclature too. LeanIn.Org’s mission is to empower women to achieve their ambitions and get to a more gender equal world. Join Emma Roberts, Global Program Lead for Lean In, for a review of the state of women at work in 2018, in terms of the gains made, the inequities that remain, and the challenges that lie ahead. In the fight for equality and forging a #BalanceforBetter, we have our work cut out for us. And many women around the world are leading the way. Emma will also share practical and research based tips from LeanIn.Org on how everyone can be a better workplace ally for women in the workplace in 2019 and beyond. The SNIA Swordfish™ specification for the management of storage systems and data services is an extension of the DMTF Redfish® specification. Together, these specifications provide a unified approach for the management of servers and storage in converged, hyper-converged, hyperscale and cloud infrastructure environments. To help speed your Swordfish development efforts, SNIA has produced open source storage management tools available now on GitHub for your use. Join this session for an overview of these open source tools, which include a Swordfish API Emulator, a Swordfish Basic Web Client, an example Swordfish plugin for the Microsoft Power BI business analytics service, and an example Swordfish plugin for the Datadog monitoring service. Cloud computing is a general concept that incorporates software-as-a-service (SaaS), platform-as-a-service (PaaS), infrastructure-as-a-service (IaaS) and other recent well-known technology trends in which the common theme is reliance on the Internet for satisfying the computing needs of the users. This channel features presentations by thought leaders who cover the key topic areas in this increasingly important field.